The search monster Google this morning posted a major update to its main search app for iOS. 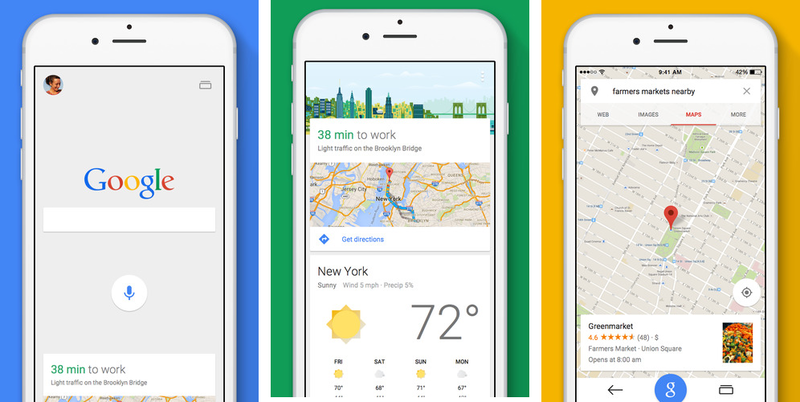 The company says it’s enhanced the software by bringing out support for the 4.7-inch iPhone 6 and 5.5-inch iPhone 6 Plus screens, a fresh new look with Material Design appearance, Maps alongside search results, easier-to-find recent searches, a “G” button that lets you start a new search from anywhere within the app and more. You can grab the completely rebuilt Google 5.0 app for the iPhone and iPad free of charge in the App Store. You’ll notice two new buttons alongside the bottom. The “G” button reduces the number of taps to take you back to search. Now, no matter where you are in the app, all it takes to go right back to the search box is a tap on the “G” button, as shown below. The new “Recents” button at the top right helps keep you organized by producing a list of recently viewed pages so you can quickly get back to any previously visited page. The interface is similar to flipping through open tabs in Safari for iPhone on iOS 8. You can easily flip through any page with a flick of your finger to juggle all your tasks. Finally, and this one’s a biggie, you can also search Google Maps within the app as Maps now show alongside your search results. Sweet! This tremendously useful addition allows you to get a quick sense of where you’re headed, Google argues (and I concur). You can even explore Street View from there if you want to take a closer look. All told, this is an awesome holiday update to Google’s native search experience on the iPhone and iPad so give it a whirl to discover the new features for yourself. Before signing off, they’ve tweaked the Home screen icon slightly. The 59.8-megabyte universal app requires iOS 7.0 or later. Download the new Google app in the App Store.